Michael Praetorius (1571-1621) played a profound role in shaping the Lutheran musical tradition as it developed from the late Renaissance into the early Baroque. The son of a devout pastor who had studied with Martin Luther, Praetorius has often been called the “conservator of the chorale,” the Lutheran chorale being the fundamental building block of music in this rich tradition — a musical ecosystem that produced J. S. Bach. 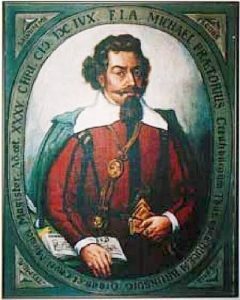 In addition to his work as an organist and prolific composer, Praetorius was also a significant music theorist. This 1994 album of Christmas music reconstructs a Lutheran liturgy as it might have been heard at one of the major churches in central Germany around 1620 (minus the long sermon). 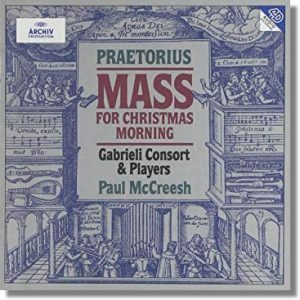 The performers on the album — Praetorius Mass for Christmas Morning — are the Gabrieli Consort and Players, conducted by Paul McCreesh. In 1993, the ensemble released a similar album called Christmas Mass in Rome which imagined the music heard in a Roman Catholic liturgy around 1620, all ordered around Palestrina’s Missa Hodie Christus natus est. Since (unlike the Roman mass) the Lutheran liturgy would have included lots of congregational singing, for the Praetorius recording McCreesh augmented his singers with the Boys Choir and Congregational Choir of Roskilde Cathedral in eastern Denmark, where the album was recorded. was found to be with child by God’s word. In the Kyrie that follows, Praetorius alternates between the traditional Greek text, “Kyrie, eleison” (Lord have mercy) and the same plea in German (Herr erbarme dich), demonstrating Luther’s commitment to maintaining the traditional liturgical languages while augmenting them with the vernacular texts. This alternation between the liturgical tongue and the common speech is also present in the final hymn presented in this liturgical reconstruction. In the joyous Nativity hymn, “Puer nobis nascitur” (To us is born a child), the choir sings a verse in Latin, then the congregation sings a verse in German, and so on back and forth. The closing track on the recording is a magnificent rendition of the fourteenth-century carol, In dulci jubilo (In sweet rejoicing), scored by Praetorius for four separate choirs, six trumpets, and drums. Do angels envy? If so, the sound of this exuberant praise might tempt them. It’s a fitting conclusion to this glorious medley of praise. I’ve summarized the highlights, but encourage you to obtain the entire album for repeated listening, especially next year on Christmas morning. (St. Louis: Concordia Academic Press, 2001).